James Alan Davie (born 1920) is a Scottish Painter and musician. Davie studied at Edinburgh College of Art in the late 1930s and he also has a great love of Cornwall. Like Pollock, many of Davie's works have been executed by standing above the painting, which is laid on the ground. He adds layers of paint until sometimes the original painting has been covered over many times. However, despite the speed at which he works he is adamant that his images are not pure abstraction, but all have significance as symbols. Championing the primitive, he sees the role of the artist as akin to that of the Shaman and has remarked upon how disparate cultures have adopted common symbols in their visual languages. As well as painting, whether on canvas or paper, Davie has produced several screen prints. He found a market for his work on the continent and in America some time before the British art public could reconcile itself to his mixture of ancient and newly invented of symbols and his explosive brushwork. His paintings appear at once apocalyptic and triumphant. In his lectures Davie stressed the importance of improvisation as his chosen method. His stance was that of an inspired soothsayer resisting the inroads of rational civilization. 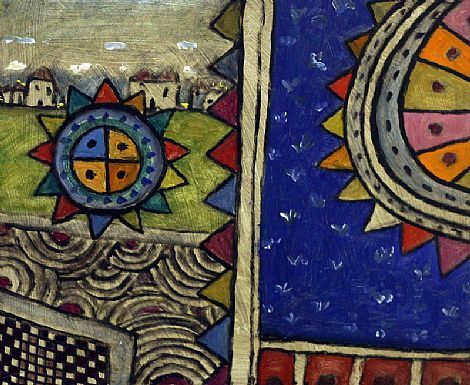 Alan Davie’s work is held in many private and public collections including the National Gallery of Scotland and the Tate Collection.